In a discontent kingdom, civil war is brewing. 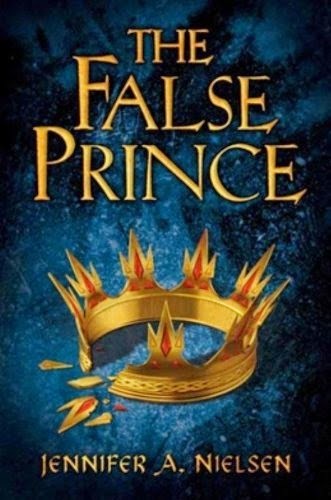 To unify the divided people, Conner, a nobleman of the court, devises a cunning plan to find an impersonator of the king's long-lost son and install him as a puppet prince. Four orphans are recruited to compete for the role, including a defiant boy named Sage. Sage knows that Conner's motives are more than questionable, yet he knows he must be chosen to play the prince or he will certainly be killed. But Sage's rivals have their own agendas as well. Who will win and at what cost? And what about the truth? This book...irked me. But sometimes, it irked in a good way. Nielsen has expertly crafted a secret-filled, twisted-plot of a book that had me doubting myself quite a few times. But, in the end, it was still the predicted ending, which was a tad disappointing. But it was a good ending, which was satisfying...see how torn I am? Also, characters were well-done. Sage was a really complex, amazing character who is extremely defiant and stubborn—so much so that I was getting annoyed with him. On the one hand, that's talented writing. On the other...I'm hesitant to read the other books in the trilogy. This is mostly based on personal preference. Overall, I'd still recommend it to anyone looking for an exciting, intriguing fantasy.